Welcome to the first homepage for FYE!!! If you're here because you are hoping to sign up for this awesome course, or just checking it out, get ready to be impressed!!! FYE was designed to be a type of learning community that will aid freshmen students in the transition from high school to college life. The class begins with summer reading and then continues on to help the students stay involved and make friendships while learning about environmental issues in a relaxed atmosphere. One of the most important aspects of FYE is that all of the students taking it are in exactly the same boat as you...incoming freshmen. Whether you feel completely prepared for college life and academics, or you are lost in the neverending sea of students, professors, and (should we mention it??)... scheduling!?!... FYE is a great place to start. You will be broken up into what we call "base groups", which will include you and approximately 5 or 6 other students and a peer mentor (an older and maybe wiser sophomore or junior who just loves to answer questions... whether they are about the exciting books we just read or something out of the blue :-) You will meet with other groups from time to time to discuss what you have come up with in your own group, and once in a while the full class will get together and do something cool (like our in-class discussions with Pulitizer Prize nominee Charles Ryan and acclaimed author Stephanie Mills....more on that later)!!! 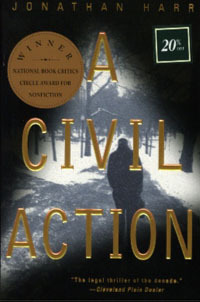 This quarter we will be reading one of the coolest books to ever be chosen for an FYE class.... an exciting novel by Jonathan Harr called A Civil Action. Two of the the nation's largest companies are accused of contaminating water that resulted in causing leukemia in a number of children in the town of Woburn, MA, and the town's only hope comes in the form of an extravagant young lawyer who has to risk everything in order to make a difference.... This is the book!!! And here's some more info about the case! Jonathan Harr This is an image taken near the scene of Wells G and H,which were a primary source of water for Woburn. The other book we will be reading this quarter is called In Service of the Wild . It is a vivid description of some of the most important environmental restoration projects in the world, written by an inspiring and well-versed author named Stephanie Mills .